I have a love / hate relationship with lemon cakes. Most of the store and bakery options I've tried have tasted harsh and artificial. No doubt they rely on lemon extracts and flavorings and those do not appeal to me. Even my own attempts to make lemon cake, using lemon juice, have been too harsh. But I'm still tempted whenever I see a photo or recipe which explains why I pinned this beautiful looking cake from Martha Stewart. A few weeks later, I saw that Elyse from The Cultural Dish had made the recipe and her photo was as tempting as the original so I was determined to give it a try. In fact, the truth is that I made this cake twice. The first time I was concerned about the large amount of lemon zest called for in the recipe. I worried it would taste harsh and decided to cut it in half. Then Brian expressed concern that the cake would be too dry (he likes his cakes extremely moist) and asked me to include the blueberries he'd just brought home from Costco. Blueberries and lemon do go well together but this was supposed to be a lemon cake. Oh, well. I love him so I did as he asked. The resulting cake was, in fact, very delicious but the blueberries (and probably the fact that I used only half the lemon zest) completely obscured the lemon flavor. The cake was cooked through but too heavy to lift out of the tube pan and Brian had to help me. He absolutely loved the result and happily ate all of it but I still wanted my lemon cake. The following week I remade the cake and this time I followed the exact instructions. Well, with one exception. The original recipe called for the inclusion of candied lemons which didn't really sound appealing. Elyse left them out and I followed her example. But otherwise, and over Brian's protestations, I faithfully followed what was written. And I was rewarded with the best lemon cake I've ever tasted. It filled the air with a light, citrus aroma and the taste was very lemony and yet completely delicate. The original recipe also includes a glaze but I tend to prefer a simpler dusting of powdered sugar on my desserts. I've included the original glaze ingredients in the recipe, though, if you'd like to try it. I will say that this cake also has a very thick streusel layer. You could easily halve the amounts in the recipe and still have enough if you wanted less streusel. Although, actually, I can't think of any reason why anyone would want less streusel... Oh, and Brian still prefers the blueberry version. Enjoy! Mix together the flour, sugar, salt and cinnamon. Cut in the butter with a pastry cutter or fork until clumps form. Cover and refrigerate while you prepare the batter. Preheat the oven to 350 degrees and butter and flour a tube (angel food) pan. In a bowl, combine the flour, baking powder, baking soda and salt. In a separate bowl, beat together the butter, sugar and lemon zest. When that has been creamed, add in the eggs, vanilla, lemon juice and sour cream and beat until combined. Working in batches, add in the flour mixture until everything is combined. Spoon the batter into the pan and even it out. Evenly sprinkle on the chilled streusel and bake for 55 minutes or until a cake tester comes out clean. Allow the cake to cool thoroughly before removing from the pan. Finish the cake by whisking together the lemon juice and confectioner's sugar and drizzling over the cake. Or, leave off the glaze and dust the top of the cake with confectioner's sugar before serving. Looks soft and lovely. Really great coffee cake! This really does look like an amazing lemon cake. I love that crumb topping! Sometimes, sticking to the recipe is the way to go! This sounds like a really nice recipe. I think I'd leave out the lemon candies too. Oh, I am loving the look of this! What a great coffee cake! Ooooh, I love the mounds of crumb topping on your cake, Anita! Yum! It's lemon. It's cake. This means Jen will be serving this at her table very soon. Who wants less streusel? Isn't that the best part? This looks wonderful! A perfect cake for brunch, or to sneak snacks of when no one is looking! I am equally picky about lemon desserts--they have to really taste like lemon. Anita, your cake looks gorgeous. I wouldn't turn down a slice of this! I have a much stronger hate relationship than love. I like my treats with chocolate unless of course they are packed filled with blueberries but then I really call it breakfast. I love coffee cakes. Actually I love anything that has a streusel topping and this one really delivers on that count. 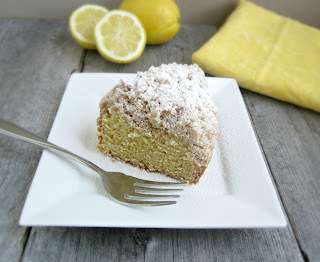 I also am very picky about lemon desserts but this one is surely going on my must bake list. Hi Anita. Yes, you said it so well! I too have a love relationship with lemon cake. I can't wait to try this. Thank you for sharing! 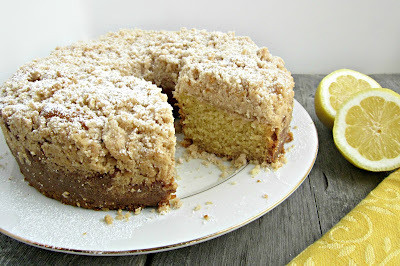 I love a good crumb cake and this looks perfect. Hey I am so glad you like this cake too! I definitely like it without the actual lemons in it as well - makes it lighter and tastes just as lemony and delicious! That cake is gorgeous! And I'm sure it tastes absolutely fresh and amazing! What a beautiful cake. I'm glad you gave it another try! what a delightful cake! And look at all that streusel!! I can't think of a reason to say no to streusel either! love your lemon cake! Very appetizing food photography! The streusel topping is very clever in tandem with the crumbliness. Very well executed! Oh my sweet lemon heaven! I love all of that crumb topping, reminds me of a coffee cake my grandma used to make. I'm with you on the glaze, I think the powdered sugar is it perfect complement to a perfect cake. Can't wait to give this one a try! whoa this is some serious delicious coffee cake! LOVE IT! I made this cake for church today. I don't know why I always want to try new recipes at 6:00 am but I do. I had never made lemon zest so that was interesting. I have to tell you though, this cake was amazing! Even trying to hurry and not knowing what I was doing. I did not have a tube pan so I used a bundt pan. Unfortunately I had to forgo the streusel topping but I did use left over glaze. From toaster streudel and put it on while cake was still hot. This cake was so good there were no left overs from church and I am going in now to make one for our house.. thanks so much..
can this be made in a springform pan? I haven't tried making it in a springform but I would actually recommend against it. It's quite a large, tall cake and I'm concerned that the center wouldn't cook properly without the center tube. A bundt pan would probably work, though. If you do try it, please let me know what happened.